Life with Lynnie: Plan of Redemption, Fulfilled! Happy Good Friday! Plan of Redemption, Fulfilled! Happy Good Friday! Here on Life with Lynnie (LwL), I always address special occasions such as this one... being Good Friday. The day when our Lord, Jesus Christ fulfilled God the Father's plan of redemption for us. Jesus was condemned to the death penalty. Extends to the shoulder. 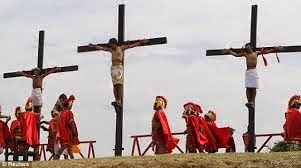 The Roman guards knew that when the nails were being hammered into the wrist, that tendon would tear and break, forcing Jesus to use His back muscles to support himself, so that He could breathe. Flesh from His body. The beating was horrific. The Crown of thorns (two to three inch thorns) cut deeply into His scalp. Most men would not have survived this torture. That, a Roman soldier who stabbed a spear into His Chest..
Face and threw stones (the cross beam was almost 30 kg of weight, to which His hands were nailed). Jesus was naked, all his clothing was removed to humiliate Him in front off everybody. So that you may have free access to God. So that your sins can be "washed" away. All of them, with no exception! Do not believe that He only died for those who go to church or for pastors, bishops, etc. We are worried of what they may think. JESUS IS THE ONLY SALVATION FOR THE WORLD . God has special plans for YOU! About what He went through to save you. That e-mail certainly describes how Jesus suffered during His crucifixion. But, once it was determined that the crucifixion of Jesus and the other two (2) men was over, more happened. 42 There laid they Jesus therefore because of the Jews' preparation day; for the sepulchre was nigh at hand." Just as we read today, prophecy was fulfilled. And, so was God's plan of redemption for us. Reader... friend... if you have not yet come to trust in/believe upon our Lord, Jesus Christ, you have not yet become saved. Jesus is the only way to gain eternal life. There is no other way. Please know... it is my heart's desire that you will gain salvation. May God bless you. As for me, I am thankful for Good Friday. For Jesus made a way for me, and all other people in the world to gain everlasting life. For this, I am thankful. Thank You, Lord!